A glass jar holds a single germ. After one minute, the germ splits into two germs. One minute after that, the two germs each split again, forming a total of four germs. Continuing at this rate, a single germ can multiply to fill the whole jar in exactly one hour. Knowing this, how long in minutes would it take to fill the jar if you had started with two germs? Did you find that problem difficult? It’s quite simple when you think about it. It takes one minute for a single germ to split into two. Therefore, starting with two germs instead of one only saves you one minute and thus the answer is be 59. 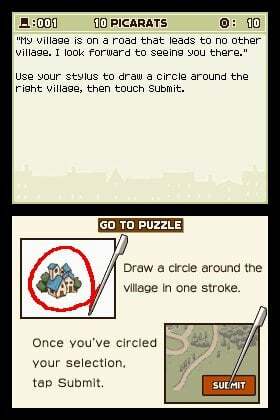 The example above is just one of the many puzzles you’ll encounter in Professor Layton in the Curious Village. If you found it simple, don’t assume that the game contains a bunch of simple puzzles, because it doesn’t. Professor Layton contains a wide variety of brainteasers and as you progress through the game they get more challenging. Thankfully, you can use hint coins to make life a little easier. Hint coins are scattered throughout the game and using them when you're stumped on a puzzle will make a hint appear. Sometimes the hints aren’t all that helpful but most of time, they are extremely beneficial. In the small and creepy village of St. Mystere, bizarre things have been occurring. The richest man in St. Mystere, Baron Augustus, has peacefully passed away leaving his fortune in the hands of “The Golden Apple”. Whomever finds "The Golden Apple” gets a piece of the fortune but unfortunately, nobody knows the whereabouts of the elusive item. Thankfully, Professor Layton and his apprentice, Luke, are on the case. You’ll scour St. Mystere looking for clues to aid you in finding “The Golden Apple”. You’ll need to solve a variety of puzzles and talk to the bizarre townsfolk to gather information on the whereabouts of “The Golden Apple”. During the course of the game, somebody gets murdered and it’s up to you to find the murderer. You’re a potential suspect in the murder case so now you have to prove yourself innocent and find out who really killed this person. Then, if that wasn’t enough, people have started disappearing in St. Mystere. It seems quite apparent that somebody is causing conflicts in St. Mystere but, who could it be? It’s up to Professor Layton and Luke to find out who before something even more tragic happens. 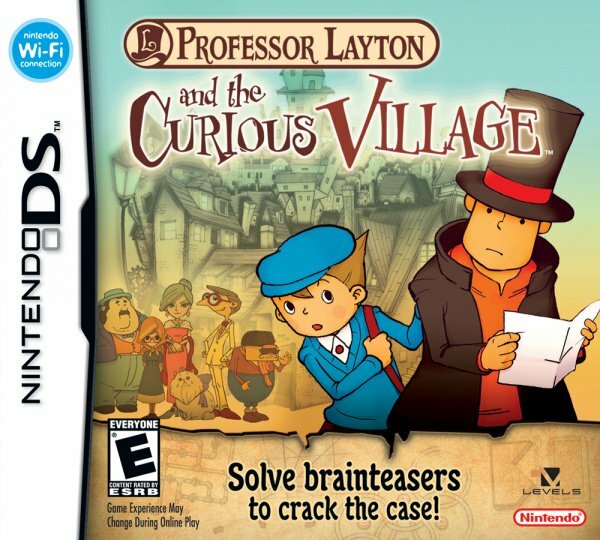 Professor Layton and the Curious Village is played using only the stylus. Simply tapping the touch screen will let you navigate St. Mystere and allow you to solve puzzles. You can also tap objects that seem bizarre and sometimes you’ll find a hint coin. Some other times, you’ll discover a hidden puzzle. 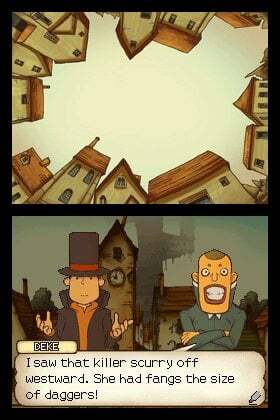 The best part about Professor Layton is undoubtedly the spectacular brainteasers the game has to offer. Though some will have you scratching your head for awhile, the majority will just need you to read the question carefully. For example, one talks about how a certain type of mouse can produce ten babies each month. Newborn mice can have babies have babies after two months. So, the puzzle asks how many babies will a mouse you bought at the pet store have in ten months. The thing is, the answer is one! The mouse can’t become pregnant by itself so it can’t go through sexual reproduction. If mice could go through asexual reproduction, then the answer wouldn’t be one. Simple, eh? In order to progress through the game, you’ll be required to solve specific puzzles. Some are optional but that doesn’t mean you shouldn’t try them. Each and every one is a work of art and is worth at least one go. 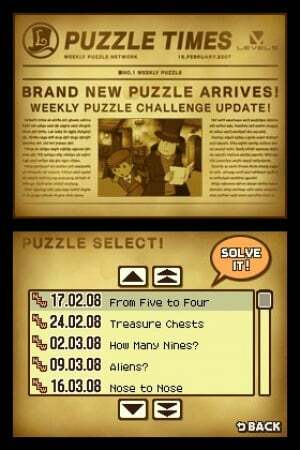 You can even download more puzzles using the wireless connection, which helps to extend the game's lifespan. Professor Layton's strength isn't just its puzzles, though. The game has a very intriguing plot and thankfully, it doesn't get too complicated. Professor Layton also allows you to collect a large variety of objects. For example, pieces of a painting are scattered across St. Mystere and if you find all the pieces and reassemble a painting to its former glory, something good will happen. Some people may complain about the game’s hand-drawn backgrounds and the total lack of 3D, but really, they're a beautiful piece of art and it's hard to see how anyone could find serious fault with them. The graphics suit the game exceptionally well and the animated sequences that occasionally appear throughout the main storyline are nothing short of breathtaking. Above all though, the most fascinating part of the cutscenes is that they're all voice acted. 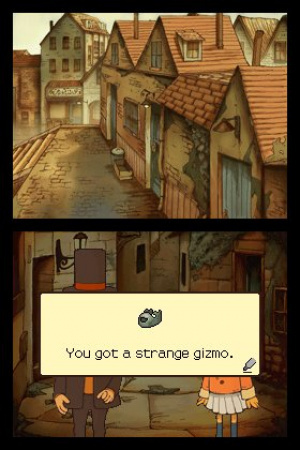 Unquestionably, Professor Layton’s graphics are some of the best on Nintendo DS. Another thing that makes this title stand out from other puzzle games is its awesome music. The music has a French flavor to it (as do the visuals, come to think of it) and it sounds fabulous while playing the game. If you’re after some exquisite music, then this will fit the bill perfectly. 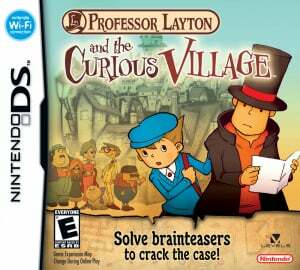 Professor Layton and the Curious Village is unquestionably one of the best Nintendo DS games released thus far. If you enjoyed games such as Brain Age or Phoenix Wright, you’ll be more than satisfied with this puzzling adventure. Naturally, once you've solved all the brainteasers and finished the story there's very little to come back to, but you'll have had so much fun getting to that point that you're unlikely to mind. With the game receiving heavy promotion throughout the world right now, you'd be silly not to invest in it. Trust us, you won't be disappointed with the final product. WOW! Yet another DS title I have to add to the wish list. I can see I'm going to be just as broke in April as I was in March. Great review Matthew, as usual! The look of this game is fantastic; long live 2D! I started out strangely disliking this game - every time you tap on an item you get "ah, this reminds me of a rather fiendish puzzle!" Once you get past that and begin to get into the game's way of thinking it becomes a lot more enjoyable, and like Damien says, it looks brilliant. The cutscenes are great for a DS! This was a good game, definitely a 9. At first it gets a little tedious because there are over 100 puzzles in the village. To even get to the end you must have completed at least 75. But the parts with the story are very good, and it was a good ending. From the same developer that's going to handle Dragon Quest IX and Ninokuni. Definitely gotta pick this one up. W00t this game is pretty fun, I'm playing it now! This game is absolutely spectacular!